The demon said to himself, “One mountain can’t hold him down.” He recited a spell once more and summoned the Emei Mountain into the air. Pilgrim again turned his head and the mountain landed on his right shoulder. Look at him! Carrying two mountains, he began to give chase to his master with the speed of a meteor! 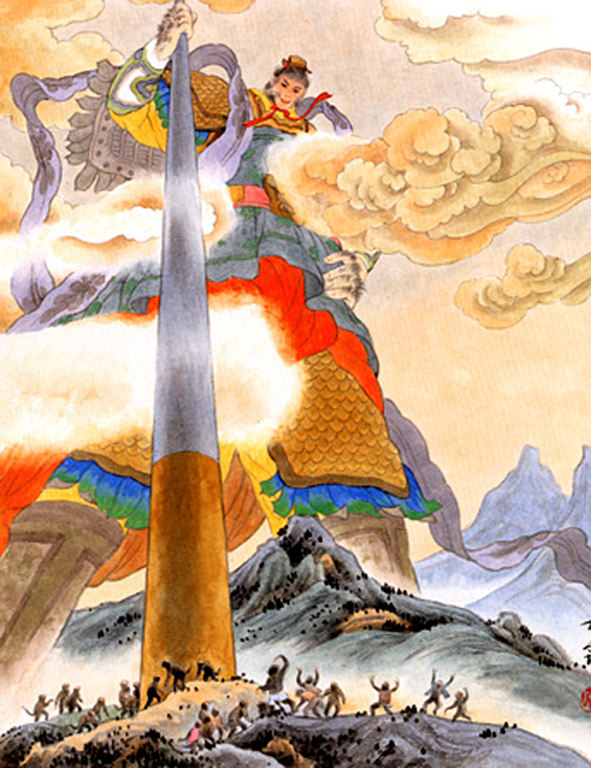 The sight of him caused the old demon to perspire all over, muttering to himself, “He truly knows how to pole mountains!” Exerting his spirit even more, he recited another spell and sent up the Tai Mountain to press down on Pilgrim’s head. 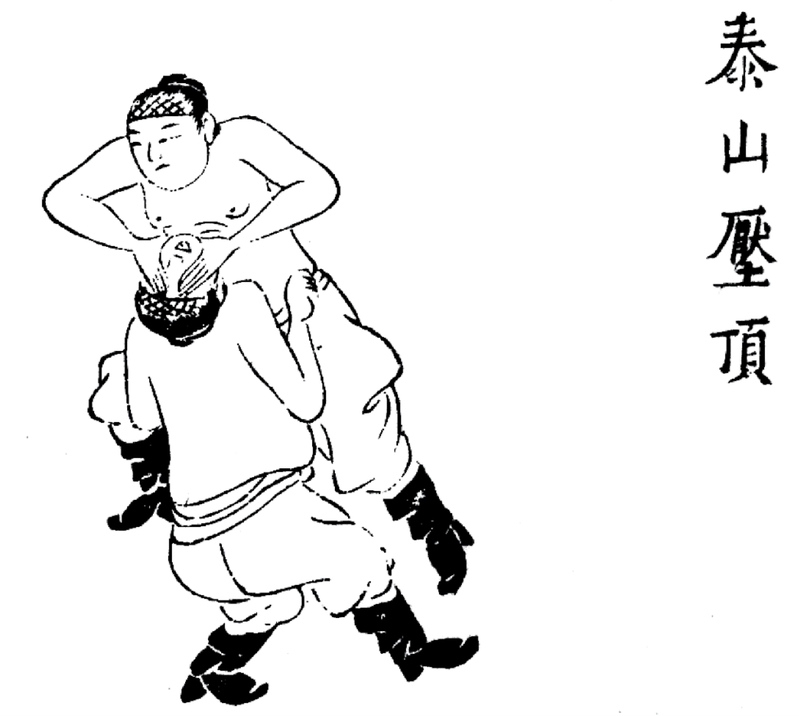 With this magic of the Tai Mountain Pressing the Head, the Great Sage was overpowered as his strength ebbed and his tendons turned numb; the weight was so great that the spirits of the Three Worms inside his body exploded and blood spurted from his seven apertures (Wu & Yu, 2012, vol 2, pp. 108-109). 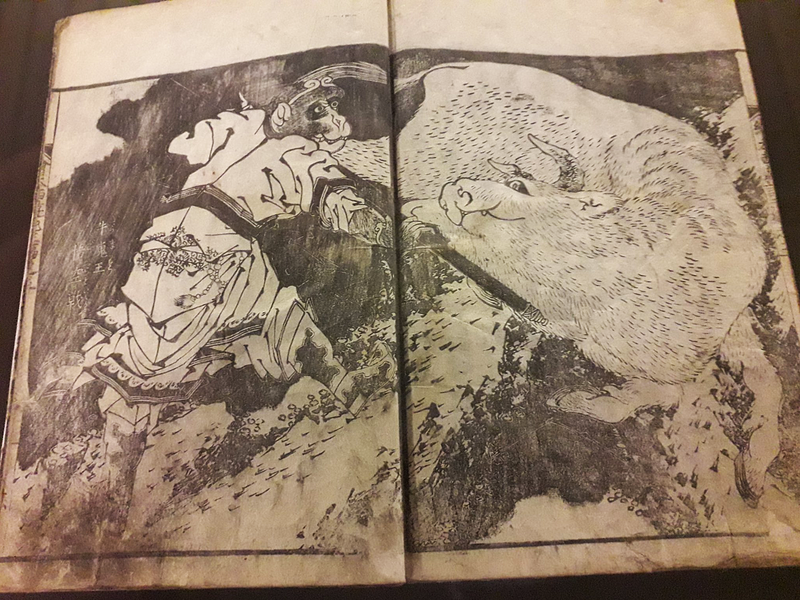 We see here Monkey is able to successfully carry the weight of both the Sumeru and Emei mountains, while running after his master “with the speed of a meteor”. That’s quite impressive, even if he is eventually crushed under the weight of a third mountain (fig. 1). Attention should be given to the particular mountains used in this episode. Let’s start with Sumeru since this is the first one mentioned. Fig. 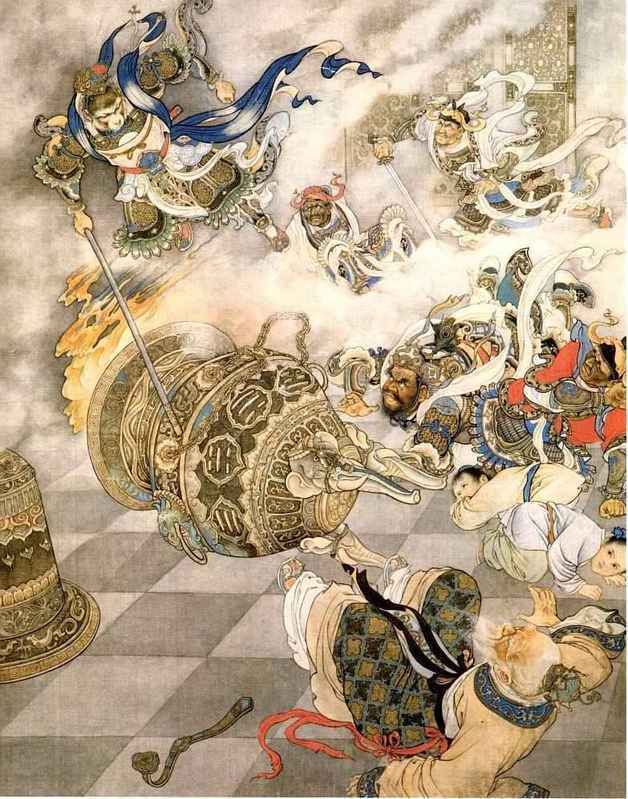 1 – Monkey trapped under the three mountains as King Silverhorn abducts Tripitaka, the dragon horse, and Sha Wujing (larger version). 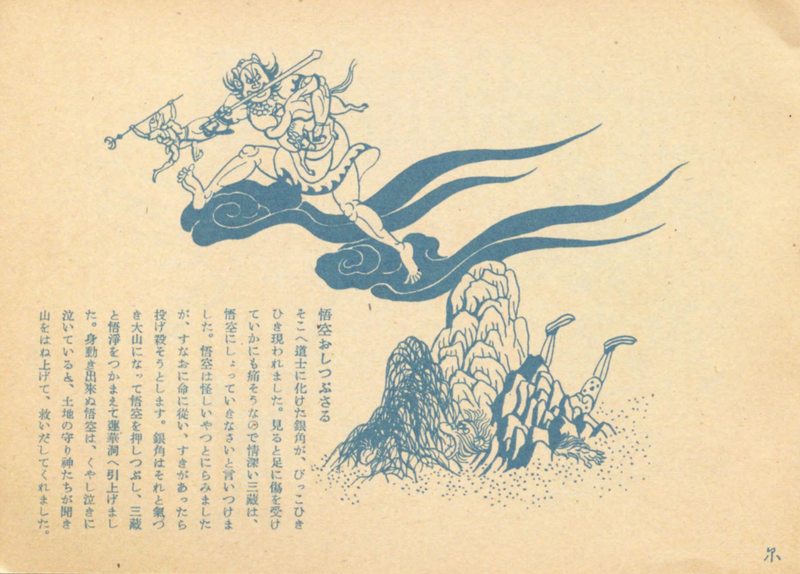 From The Illustrated Journey to the West, a children’s book published in 1950. The central axis of the universe in Buddhist cosmology; also known as Mount Meru. 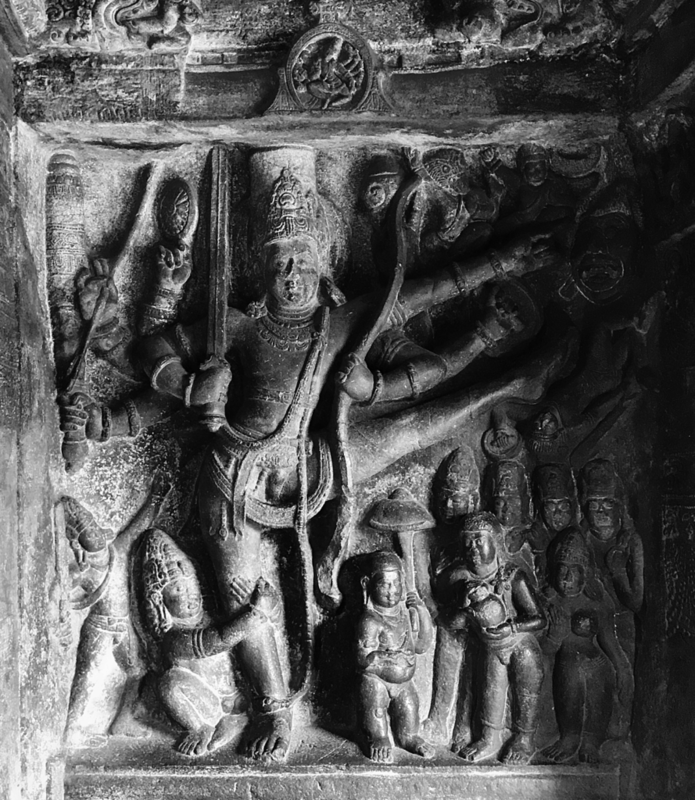 Mount Sumeru stands in the middle of the world as its axis and is eight leagues high … The slopes of Sumeru are the abode of demigods, and its upper reaches are the heavens of the four heavenly kings. At the summit of the mountain is the heaven of the thirty-three, ruled by the king of the gods, Sakra. 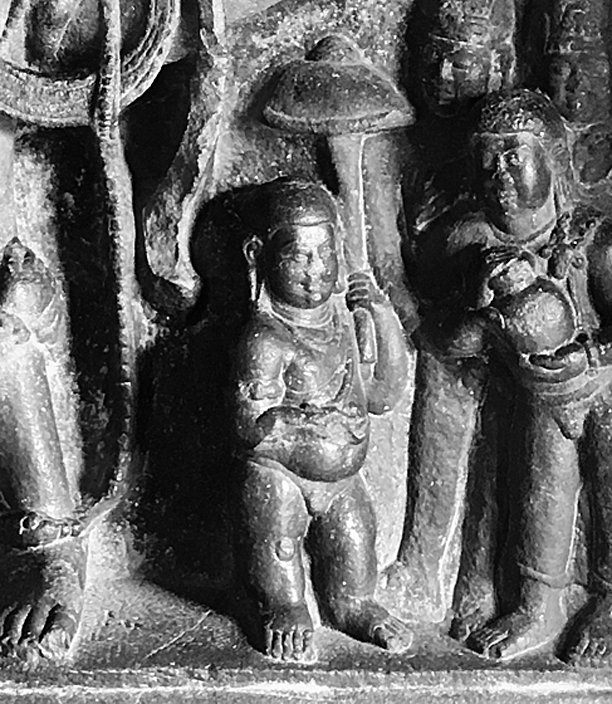 Above Mount Sumeru are located the remaining heavens of the sensuous realm [fig. 2] (p. 896). A poem in chapter four of Journey to the West describes what Monkey sees when he first comes to live in heaven as the Keeper of the Heavenly Horses. A portion reads, “Thirty-three mansions were found up here, / With names like the Scattered Cloud, the Vaisravana, the Pancavidya, the Suyama, the Nirmanarati…” (Wu & Yu, 2012, vol 1, p. 146). Translator Anthony C. Yu notes, “The verse here is alluding to the Indra heaven with it’s thirty-three summits (trāyastriṃśa) [fig. 2] and the six heavens of desire (devalokas)”, which are located atop Mount Sumeru (Wu & Yu, 2012, vol 1, p. 510, n. 1). Therefore, the heaven described in the novel is located on the same cosmic mountain as that from Hindo-Buddhist cosmology, meaning Monkey successfully supports the axis of the universe on one shoulder. Fig. 2 – Mount Sumeru indicated in gold. The location of the aforementioned 33 heavens/mansions are indicated in pink. A great cosmic ocean is indicated in blue (larger version). Adapted from Robert & David, 2013, p. xxxii. Mount Emei (Emei shan, 峨嵋山; 峨眉山) is one of the four sacred Buddhist mountains of China. It is considered extremely important as Chinese tradition believes, upon entering the Middle Kingdom from India, Buddhism spread from this very mountain during the eastern Han Dynasty and proliferated throughout China. The mountain is 10,167 feet high, making it over 3,000 feet taller than the other sacred Buddhist mountains. This place is believed to be the heavenly abode of the Bodhisattva Samantabhadra, making him the patron saint of Emei (Robert & David, 2013, pp. 282-283). 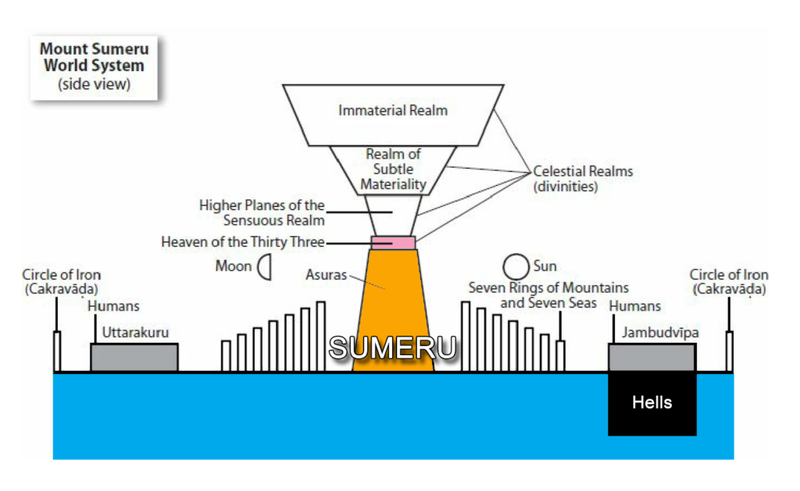 I want to reiterate the fact that both Sumeru and Emei are important to Buddhism. 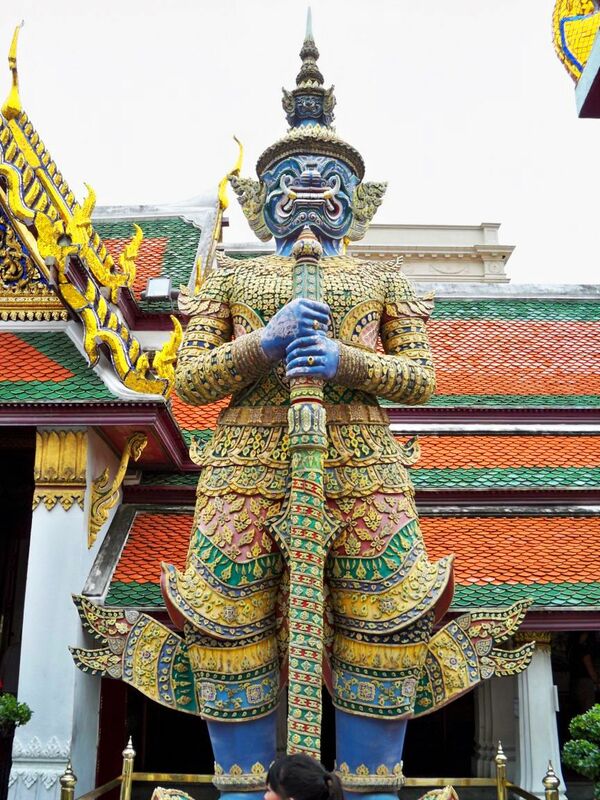 Not only does Monkey support the very axis of the Buddhist universe on one shoulder, he supports on the other the very mountain from which the religion is believed to have spread into China. 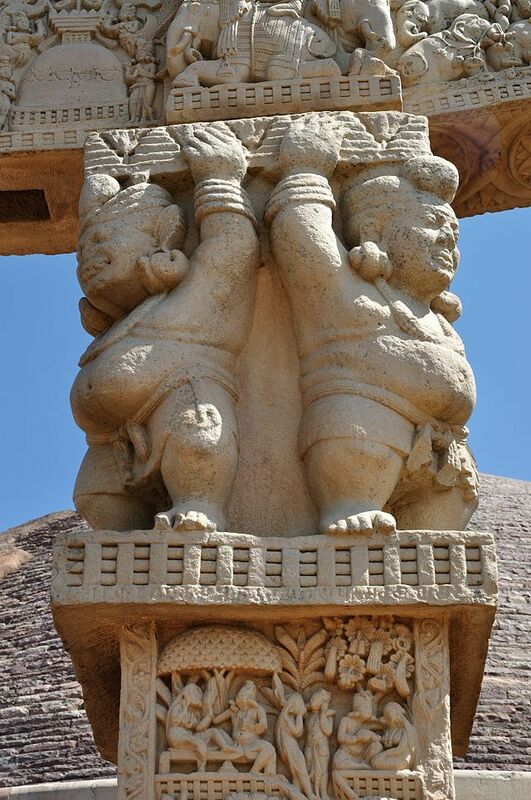 I’m not sure if this was the author/compiler’s original intent, but it seems as if this feat of strength could be symbolism for Monkey literally “supporting” Buddhism by protecting his master on their journey to India. After all, the historical Xuanzang (玄奘, 602-664) on whom Tripitaka is based is considered to be one of, if not the, most prolific translators of Buddhist texts in the history of Chinese Buddhism (Robert & David, 2013, pp. 1015-1016). I turn now to Mount Tai (Taishan, 泰山), the mountain that ultimately overwhelms Sun Wukong’s supernatural strength. It is one of the five sacred mountains of China, which differ from the four Buddhist counterparts mentioned above. Mount Tai was the epicenter of a state cult in Ancient China, one in which Sage-Kings and emperors of millennia past traveled there to perform sacrifices to heaven, thereby gaining the right to rule or attaining eternal life. An entry in the Classic of History (Shujing, 書經, 4th-c. BCE) suggests the practice goes all the way back to the Sage-King Shun (3rd millennia BCE) (Poo, 2011, pp. 20-21). Due to its great cultural and historical significance, the mountain came to be recognized as an adamantine monolith, the very name of which was used as a metaphor for something unfathomably heavy, whether it be a physical measure of weight or philosophical importance. For example, Warring States philosopher Mozi took part in a debate over the plausibility of his school of thought taking center stage in Chinese society. His opponent claimed, “As we see it, one can no more put it into practice than one can pick up Mount Tai and leap over a river with it!” Mozi highlighted the irrelevant nature of the metaphor by replying, “As for picking up Mount Tai and leaping over rivers with it, no one from ancient times to the present, from the beginning of humankind to now, has ever succeeded in doing that!” (Watson, 1999a, p. 71). Another example comes from the Han historian Sima Qian who wrote, “A man has only one death. That death may be as weighty as Mount Tai, or it may be as light as a goose feather. It all depends upon the way he uses it” (pp. 371-372). Therefore, the mountain represented the heaviest thing imaginable in Chinese culture. It’s no wonder then that not even Monkey could withstand its weight. The idea of Mount Tai symbolizing a heavy object influenced the name of a 17th-century technique related to the development of Taiji boxing called “Crush with the Weight of Mount Tai” (Taishan yading, 泰山壓頂) (fig. 3), which involved climbing onto an opponent (Henning, 2009, pp. 78 and 82). Incidentally, the name of this technique is also a common chinese saying referring to someone being under a lot of stress (Gao, Wang, & Weightman, 2012, p. 191). Fig. 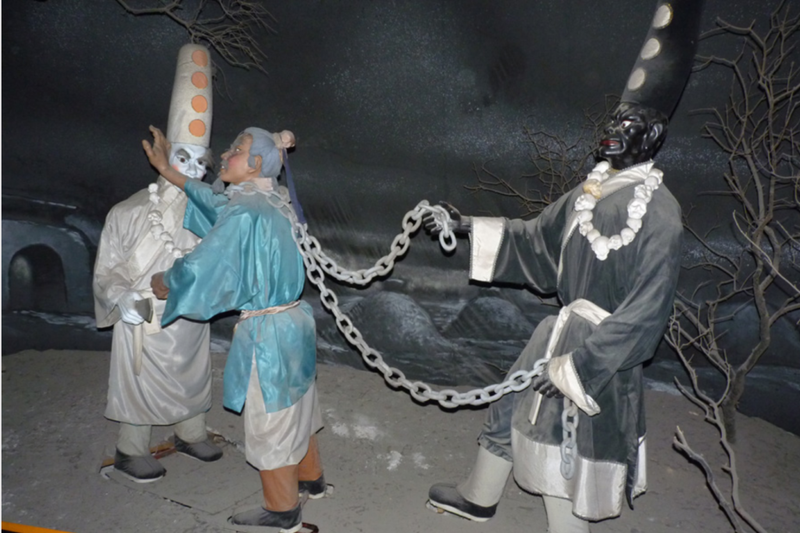 3 – “Crush with the Weight of Mount Tai”. From Henning, 2009, p. 78 (larger version). I find it interesting that, after easily bearing the weight of two Buddhist mountains, Mount Tai is the proverbial straw that broke the camel’s back. Mount Tai represents native Chinese history and culture, while Sumeru and Emei represent Buddhism, a non-native religion from India. Therefore, this episode could be read as a struggle between the domestic and foreign aspects of Chinese culture. Considering the monsters are later revealed to be Daoist attendants of Laozi sent by heaven to test the resolve of the pilgrims (Wu & Yu, 2012, vol. 2, p. 145), it’s possible the conflict is between Daoism, a native Chinese religion, and Buddhism. This is obviously not a perfect theory, though. For instance, Laozi reveals that it was actually the Bodhisattva Guanyin who requested the lads be sent (Wu & Yu, 2012, vol. 2, p. 145). Does this explain why a Daoist spirit would summon two Buddhist mountains to crush Monkey? I’m interested in what others think. Fig. 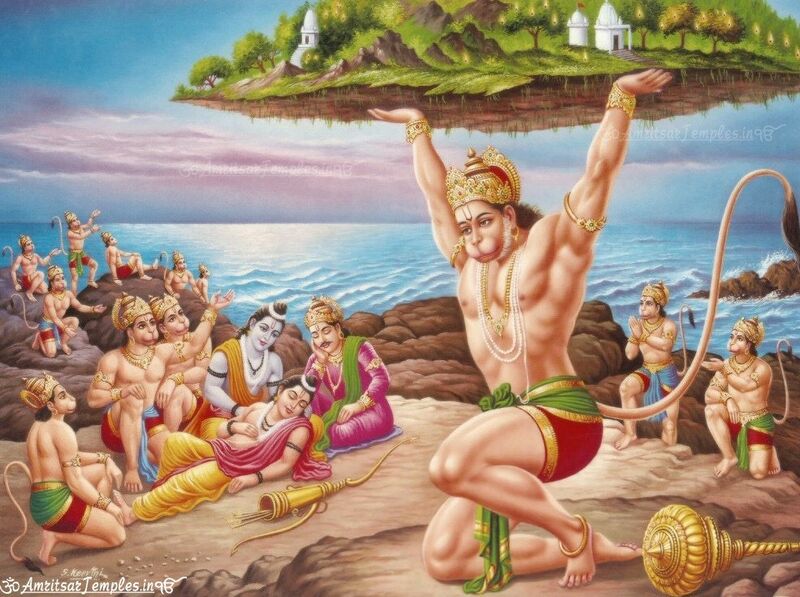 4 – A modern painting of Hanuman lifting the mountain (larger version). All credit goes to the original artist S. Keerthi. Lastly, I would like to note Sun Wukong’s feat of lifting mountains recalls an episode in the Ramayana (4th-c. BCE) in which the monkey god Hanuman carries back a mountain laden with magical herbs to heal the wounds of his master‘s brother Lakshmana (fig. 4). 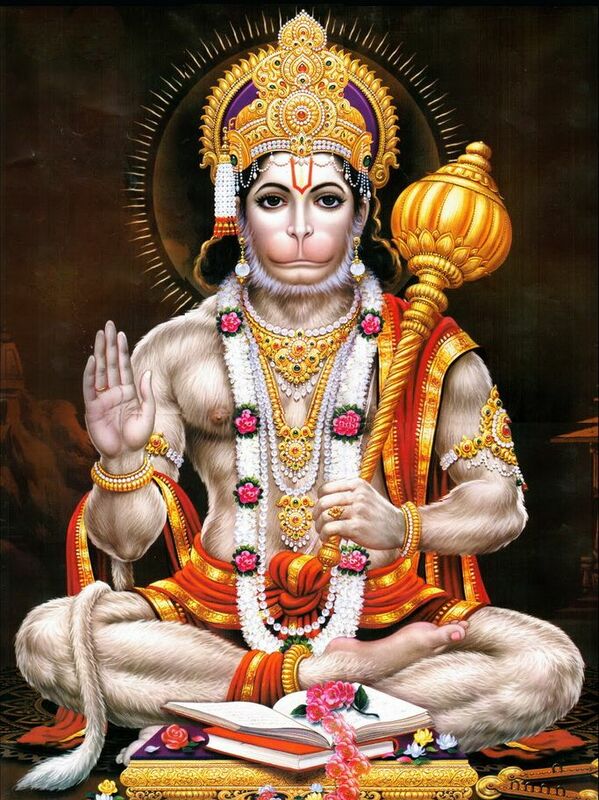 Hanuman is the living embodiment of strength (shakti) in India (see for example Alter, 1992). Monkey is believed to be loosely based on Hanuman (Walker, 1998), so there could be a connection between both instances of mountain lifting. Fig. 5 – Erlang poling the mountains (larger version). Artist unknown. 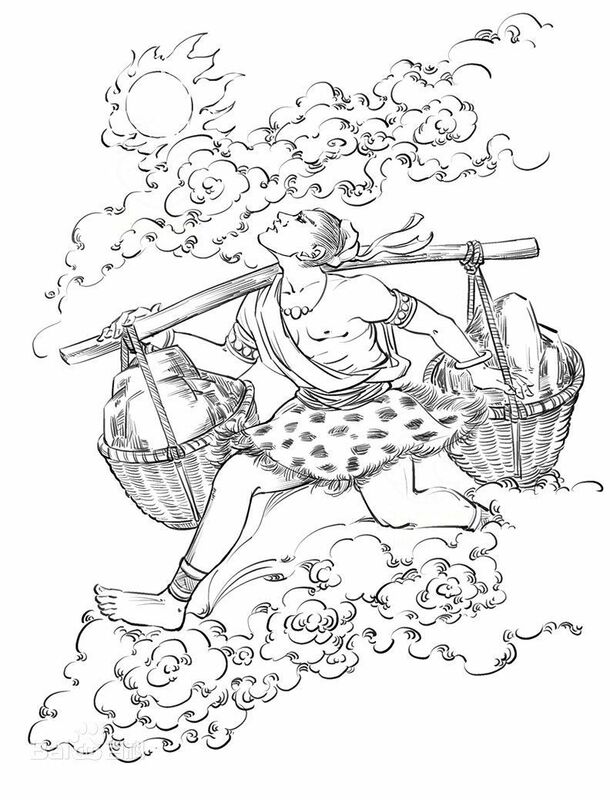 “I can tote mountains to chase down the sun” (shan hui dan shan gan ri tou, 善會擔山趕日頭) is a clear allusion to the ancient tale “Erlang carries mountains to chase the suns” (Erlang dan shan gan taiyang, 二郎擔​​山趕太陽). The tale describes how the ancient earth was plagued by many suns that scorched the land, making it impossible for the people to grow anything. Vowing to end this plight, the hero Erlang shoulders two mountains hanging from a tree and, with the aid of magical shoes, chases down each sun [fig. 5], using the weight from both landmasses to overwhelm and crush the superfluous celestial bodies (担山赶太阳, n.d). 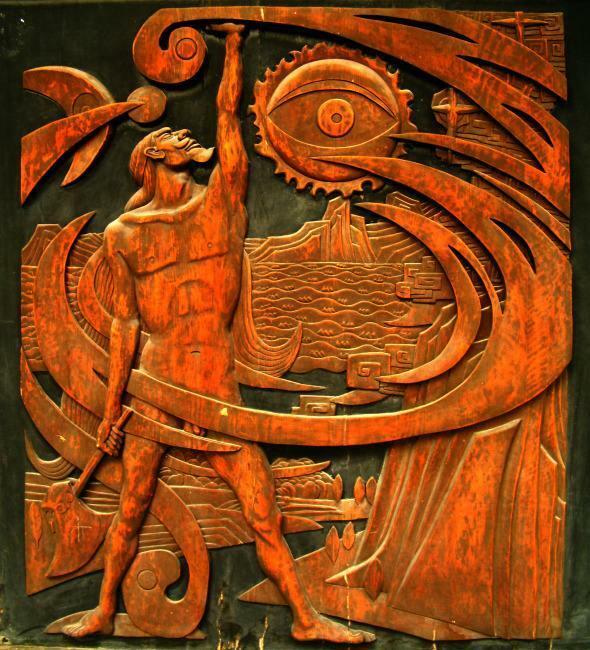 Apart from the feat of lifting two mountains, Erlang’s fleet pursuit of each sun (gan taiyang, 趕太陽) foreshadows Monkey “giv[ing] chase to his master with the speed of a meteor” (fei xing lai gan shifu, 飛星來趕師父). 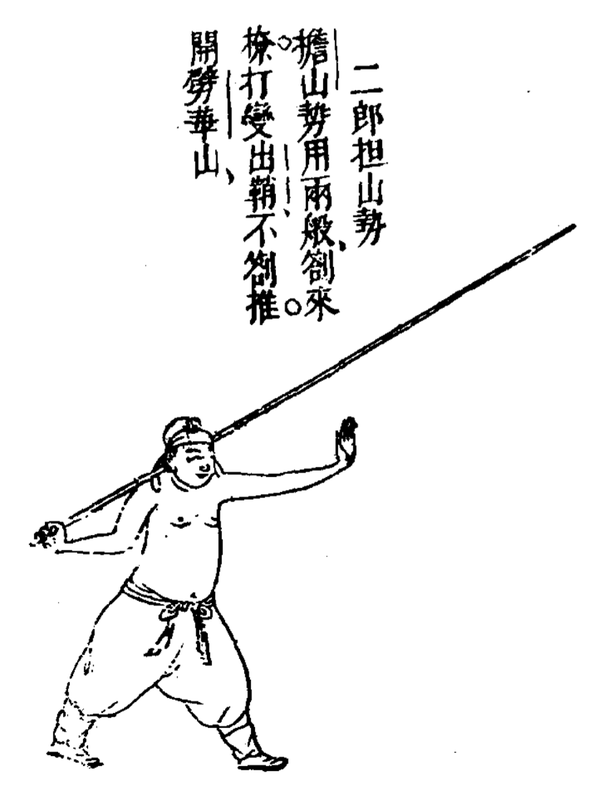 It’s interesting to note that “Erlang Carrying Mountains” (Erlang dan shan, 二郎擔山) is a common Shaolin stance, and a staff variant even appears in the Collection of Military Works (Wubei zhi, 武備志, c. 1621), a Ming treatise on military armaments and fighting techniques (fig. 6). The staff obviously recalls the pole (or in this case tree) that Erlang uses to bear the weight of the mountains. Fig. 6 – The “Erlang Carrying Mountains” staff stance (larger version). Alter, J. S., & OUP. (1992). The wrestler’s body: Identity and ideology in north India. Berkeley, Calif: University of California Press. Gao, W., Wang, A., & Weightman, F. (2012). A handbook of Chinese cultural terms. Bloomington, Indiana: Trafford On Demand Pub. Henning, S. (2009). Taijiquan: Symbol of traditional Chinese martial arts culture. Journal of Chinese Martial Arts (1), pp. 76-83. Poo, M. (2011). Preparation for the afterlife in ancient China In Olberding, A., & Ivanhoe, P. J. (Ed.) Mortality in traditional Chinese thought (pp. 13-36). Albany: State University of New York Press. Walker, H.S. (1998). Indigenous or foreign? A look at the origins of monkey hero Sun Wukong. Sino-Platonic Papers, 81, 1-117. Watson, B. (1999a). Mozi: Utility, uniformity, and Universal Love In De Bary, W. T. & Bloom, I. (Ed.) Sources of Chinese Tradition: Volume 1: From Earliest Times to 1600 (pp. 64-76). New York: Columbia University Press. Watson, B. (1999b). The great Han historians In De Bary, W. T. & Bloom, I. (Ed.) Sources of Chinese Tradition: Volume 1: From Earliest Times to 1600 (pp. 367-374). New York: Columbia University Press. Wu, C., & Yu, A. C. (2012). The journey to the West: Volumes 1-4. Chicago, Illinois : University of Chicago Press. Gold Cicada was his former divine name. […] (Wu & Yu, 2012, vol. 1, p. 275). Details about the extent of the former celestial’s punishment is revealed throughout the book. For instance, in chapter 33 a demon explains the source of Tripitaka’s heavenly aura: “That Tang Monk is actually the incarnation of the Elder Gold Cicada, a virtuous man who has practiced austerities for ten existences” (Wu & Yu, 2012, vol. 2, p. 105). Furthermore, in chapter 100 the Buddha remarks that his former disciple was “banished to find another incarnation in the Land of the East” and that “by remaining faithful to [Buddhism], succeeded in acquiring the True Scriptures” (Wu & Yu, 2012, vol. 4, p. 381). So we learn the Golden Cicada was banished to live out ten pious lives in China until the time came for him to gain merit as the scripture pilgrim, thereby gaining reentry into paradise. Anthony C. Yu (2008) vaguely alludes to chapter 99 explaining the source of the name Golden Cicada (p. 110). I can’t find such an overt explanation, but the chapter does mention the monk miraculously surviving drowning after being dumped into a heavenly river, along with his disciples and the hardwon scriptures, by a disgruntled turtle spirit. Guanyin exclaims: “Ah! It was fortunate that the Tang Monk had cast off his mortal frame and attained the way. If he were like the person he had been before, he would have sunk straight to the bottom” (Wu & Yu, 2012, vol. 4, p. 363). The “cast[ing] off of his body” (tuotai, 脫胎) is reminiscent of the way in which the real life insect sloughs off its shell (fig. 1). If this is what Yu was referring to, I think this is but one part of the puzzle. Fig. 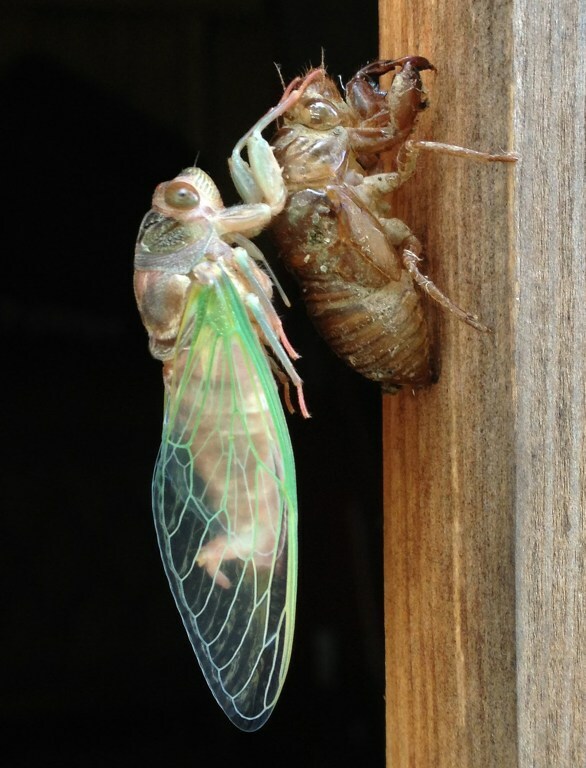 1 – A newly formed cicada clinging to its shell (larger version). 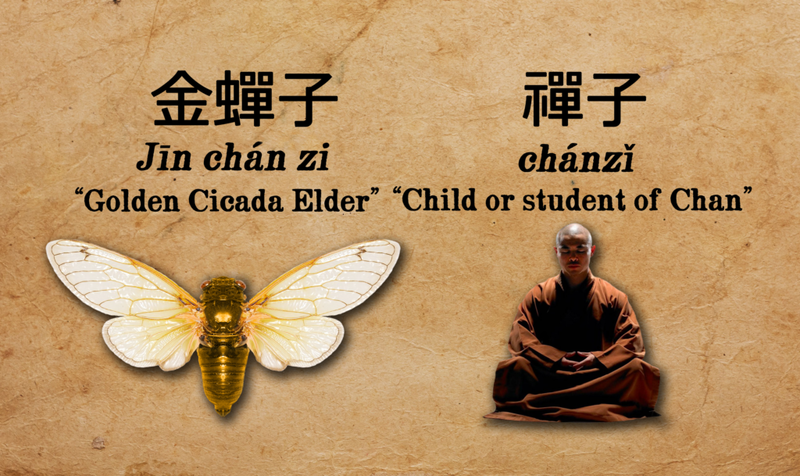 I suggest the author/compiler of Journey to the West chose the imagery of the cicada for the symbolic nature of its life cycle. 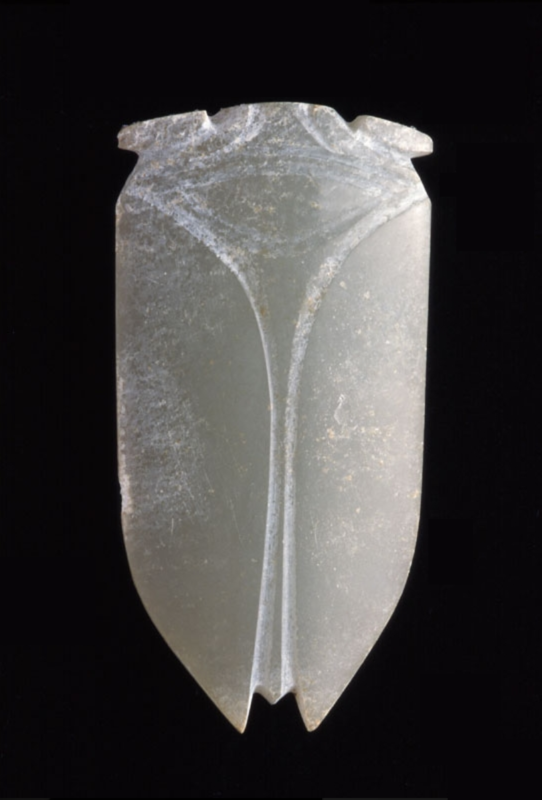 Hugo Munsterberg (1972) describes the insect’s role in ancient Chinese religion: “Cicadas carved in jade are frequently found in graves of the Han period [fig. 2]. Since the cicada hatches above ground, spends a long period underground, and finally emerges as if in rebirth, these burial tokens were probably intended to induce resurrection by sympathetic magic” (32). The Golden Cicada’s life follows this cycle very closely. The celestial being resides above in the Western Paradise, is banished below for an extended period of time, and is only allowed back into the celestial realms after a metamorphosis. Fig. 2 – A stylized Han-era jade cicada (larger version). Photo by the Asian Art Museum. All at once they saw a corpse floating [fig. 3] … upstream, the sight of which filled the elder [Tripitaka] with terror. “It’s you! It’s you!” said Eight Rules [Zhu Bajie] also. A primal spirit of mutual love has grown. Here, we see Tripitaka has shed his mortal form to become a buddha just like the cicada sheds its shell to grow wings and fly. The monk has freed himself from the endless cycle of birth and death to achieve nirvana. Fig. 3 – A woodblock print detail showing the shedding of Tripitaka’s mortal body (larger version). From Mr. Li Zhuowu’s Literary Criticism of Journey to the West (16th-c.). It’s interesting to note that the early Ming zaju play Journey to the West (c. 15th-century) depicts Tripitaka as the reincarnation of an arhat named Pulujia (毗廬伽尊者). Dudbridge (1970) translates this as Vairocana (p. 193), which is the name of a major Buddha. This shows Tripitaka was associated with heavenly personages even before the final 1592 novel was published. Therefore, the author/compiler of the novel no doubt fashioned the tribulations of the Golden Cicada around preexisting folklore. The 36 Stratagems (Sanshiliu ji, 三十六計, c. 5th-6th-cent. ), a collection of military, political, and civil tactics, contains a plan known as “The Golden Cicada Sheds its Shell” (Jinchan tuoke, 金蟬脫殼), which entails leaving a decoy that distracts the enemy while the losing force is retreating. I’m not sure if this directly influenced the celestial’s title, but it at least shows the name was known long before the novel was published. The depiction of the novelistic Xuanzang surely and constantly associates him and his entourage with Chan. Revealing examples can readily be found in both narrative content and such titular couplets as “Tripitaka does not forget his origin; / The Four Sages test the Chan Mind” (chapter 24); “The Child’s tricky transformations confuse the Chan Mind; / Ape, Horse, Spatula, and Wood Mother-all are lost” (chapter 40); “The Chan Lord, taking food, has demonic conception; / Yellow Dame brings water to dissolve perverse pregnancy” (chapter 53); “Rescuing Tuoluo, Chan Nature is secure; / Escaping defilement, the Mind of Dao is pure” (chapter 67); “Mind Monkey envies Wood Mother; / The demon lord plots to devour Chan” (chapter 85); and “Chan, reaching Jade-Flower, convenes an assembly; / Mind Monkey, Wood, and Earth take in disciples” (chapter 88) (Wu & Yu, 2012, vol. 1, pp. 64-65). If true, this would mean the cicada-like spiritual transformation was based around a pun. Fig. 4 – The similarities in form and pronunciation of chanzi (larger version). This seems like such an obvious connection that I wouldn’t be surprised if someone else beat me to the conclusion by decades or even centuries. 1) The turtle had previously helped the pilgrims cross the same river in chapter 34, and in return they agreed to ask the Buddha when the terrapin would be allowed to achieve human form (for all creatures strive for such an attainment). But Tripitaka forgot to ask the Enlightenment One while visiting the Western paradise, so the turtle dumped them into the river upon their return. Munsterberg, H. (1972). The arts of China. Rutland, Vt: C.E. Tuttle Co.
Yu, A. C. (2008). Comparative journeys: Essays on literature and religion East and West. NY: Columbia University Press. Arriving at the Tushita Palace, Laozi loosened the ropes on the Great Sage, pulled out the weapon from his breastbone, and pushed him into the [brazier]. He then ordered the Daoist who watched over the brazier and the page boy in charge of the fire to blow up a strong flame for the smelting process. The brazier, you see, was of eight compartments corresponding to the eight trigrams of Qian [☰/乾], Kan [☵/坎], Gen [☶/艮], Zhen [☳/震], Xun [☴/巽], Li [☲/離], Kun [☷/坤], and Dui [☱/兌]. The Great Sage crawled into the space beneath the compartment that corresponded to the Xun trigram. Now Xun symbolizes wind; where there is wind, there is no fire. However, wind could churn up smoke, which at that moment reddened his eyes, giving them a permanently inflamed condition. Hence they were sometimes called Fiery Eyes and Diamond Pupils (Wu & Yu, 2012, p. 189). Laozi checks the furnace forty-nine days later expecting ashes, but is surprised when Sun Wukong emerges and kicks over the mystical oven (fig. 1). This episode has two likely sources. Fig. 1 – Monkey knocking over Laozi’s furnace (larger version). [T]he iron caldron changed into a lily pad on which I sat, surrounded by the cool waters of a pond. I could sleep or just sit there. It was very comfortable (Wivell, 1994, p. 1203). Mair (1987) notes the story of a youth being tortured by his stepmother is based on a Dunhuang transformation text with two versions dated 946 and 949, respectively (p. 43). The text focuses on the trials of the future Emperor Shun. The boiling episode does not, however, appear in the story. I find this source particularly amusing because the high god of Daoism is in essence subjected to the same punishment as the one he suggests for Sun Wukong. The reaction vessel has fire around it (when it is placed inside the heating apparatus), under it (when it is placed over the heating apparatus), or above it (when it is entirely covered by ashes inside the heating apparatus). It may contain an inner reaction-case in which the ingredients are placed. In a more complex model, a “water-vessel” containing water and a “fire-vessel” containing the ingredients can be assembled, the former above and the latter below or vice versa. The vessel must be hermetically closed and should not bear any openings or cracks. Fig. 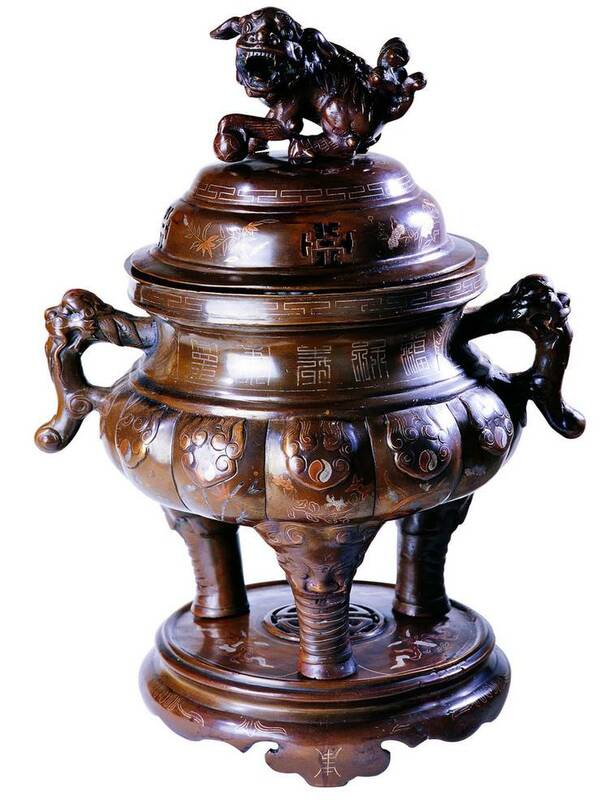 2 – An ornate wooden replica dinglu reminiscent of the metal type used in external alchemy (larger version). Fig. 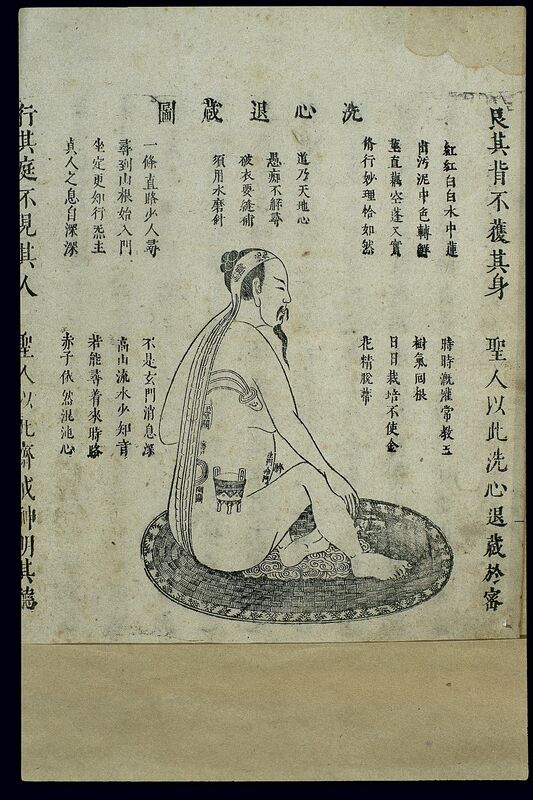 3 – An early 17th-century woodblock print depicting a lidless ding vessel in the lower torso of a Daoist practitioner (larger version). The concept of consuming alchemically derived elixirs is first mentioned in Discourses on Salt and Iron (Yantie tun, 鹽鐵論, c. 60 BCE). Later, the Token for the Agreement of the Three According to the Book of Changes (Zhouyi cantong qi, 周易參同契, c. 2nd-century CE) standardized the use of toxic materials, such as lead and mercury, for making said elixir, and this idea remained entrenched until the Tang Dynasty (618-907) (Pregadio, 2008, pp. 1002-1003). External alchemy was eventually superseded in popularity by Internal alchemy (neidan, 内丹) from the Tang onward and was still popular during the Ming dynasty (1368-1644) when the final version of Journey to the West was published. The second meaning is the human body as a metaphor for the furnace (i.e., internal alchemy). The Token for the Agreement of the Three, the aforementioned Daoist text, considers “the 5 organs, 12 vessels, 24 vertebrae, and 360 joints … all part of this body dinglu” (Wang, 2012, p. 192). The corporal furnace, the ingredients (yao, 藥), and the firing time (huohou, 火候) combine to make the “three essentials” (sanyao, 三要) of internal alchemy (Robinet, 2008). The ingredients are yin and yang energy and the firing time is the measured absorption of said energies and the time at which this activity is partaken (Wang, 2012, pp. 192-193). The methods that Sun Wukong use to achieve immortality stand as perfect examples of this process. For instance, he performs breathing exercises after midnight and before noon (in the period of “living qi”) to absorb yang energy. This energy is then purified and circulated throughout his body to power the formation of his immortal spirit. Monkey’s time in Laozi’s furnace likely borrows from two sources, the story of a child magically surviving boiling in Master of the Law, the 13th-century precursor of Journey to the West, and the story of Laozi magically surviving boiling from Laughing at the Dao, an anti-Daoist polemic of the 6th-century. The latter is humorous as it shows Monkey’s punishment is a recapitulation of the high god’s punishment. Journey to the West presents two forms of alchemy; the concept of Laozi’s furnace refers to “external” alchemy and harkens back to Han Dynasty China when alchemists used such furnaces to fire toxic mercury and lead in an attempt to produce an elixir of immortality; Sun Wukong’s use of breathing exercises and qi circulation is a prime example of “internal” alchemy in which the body is used as the furnace to fire the immortal elixir. External alchemy fell out of favor during the Tang and was superseded by Internal alchemy from then on into the Ming when Journey to the West was published. 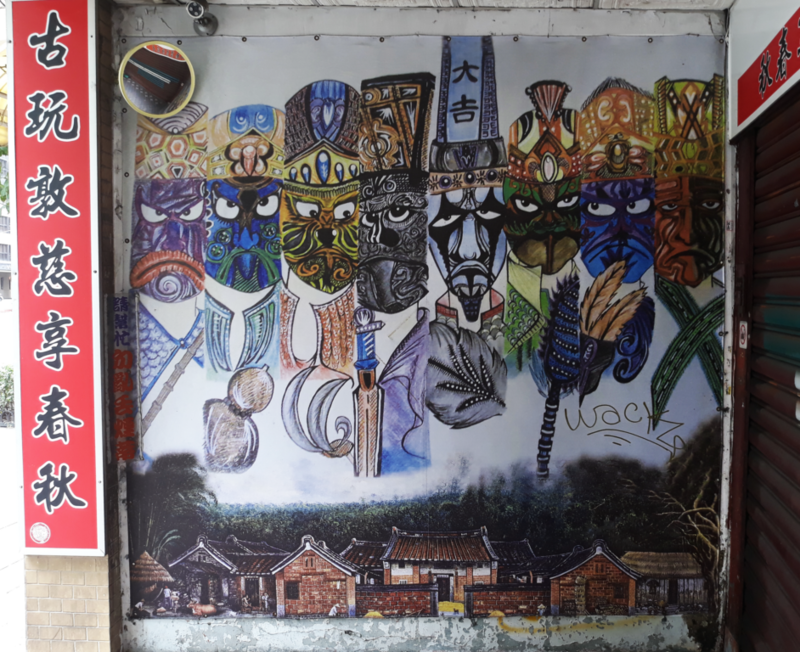 Therefore, the novel portrays the high god of Daoism as a proponent of the dated external school, while earthly immortals like Monkey are portrayed as proponents of the then current internal school. 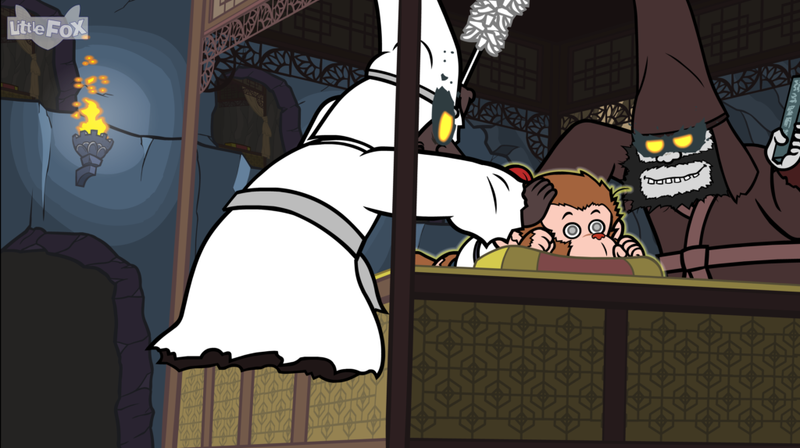 Sun Wukong fears the more powerful of his earthly counterparts,  while he gives Laozi little to no respect. For example, when Monkey first escapes from the furnace, “Laozi rushed up to clutch at him, only to be greeted by such a violent shove that he fell head over heels while the Great Sage escaped” (Wu & Yu, 2012, p. 189). This could have been meant as a statement declaring the superiority of the internal over the external. 1) For a complete translation, see Bodman (1994). 2) See Zürcher & Teiser (2007) pp. 299-300 and p. 431 n. 53. 3) One example is his teacher Subhuti. Bodman, R. W. (1994). The transformation text on the boy Shun’s extreme filial piety. In Mair, Victor H. The Columbia anthology of traditional Chinese literature (pp. 1128-1134). New York: Columbia University Press. Kim, D. (2008). Dinglu: I. Waidan In F. Pregadio (Ed. ), The encyclopedia of Taoism: Volume 1 (pp. 360-361). London [u.a. : Routledge]. Mair, V. H. (1987). 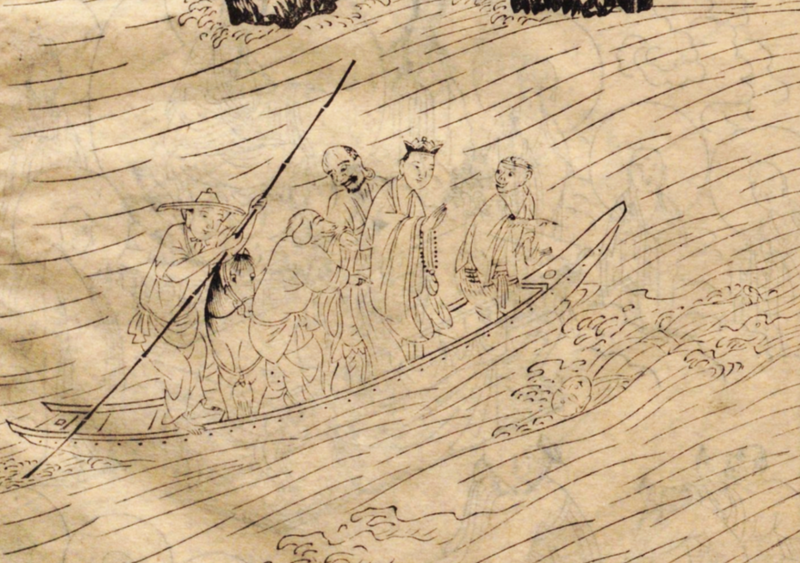 Parallels between some Tun-Huang manuscripts and the 17th chapter of the Kozanji Journey to the West. Cahiers d’Extrême-Asie, 3, 41-53. Pregadio, F. (2008). Waidan In F. Pregadio (Ed. ), The encyclopedia of Taoism: Volume 2 (pp. 1002-1005). London [u.a. : Routledge]. Robinet, I. (2008). Dinglu: II. Neidan In F. Pregadio (Ed. ), The encyclopedia of Taoism: Volume 1 (pp. 361-362). London [u.a. : Routledge]. Wang, R. (2012). Yinyang: The way of heaven and earth in Chinese thought and culture. Cambridge: Cambridge University Press. Wivell, C. S. (1994). 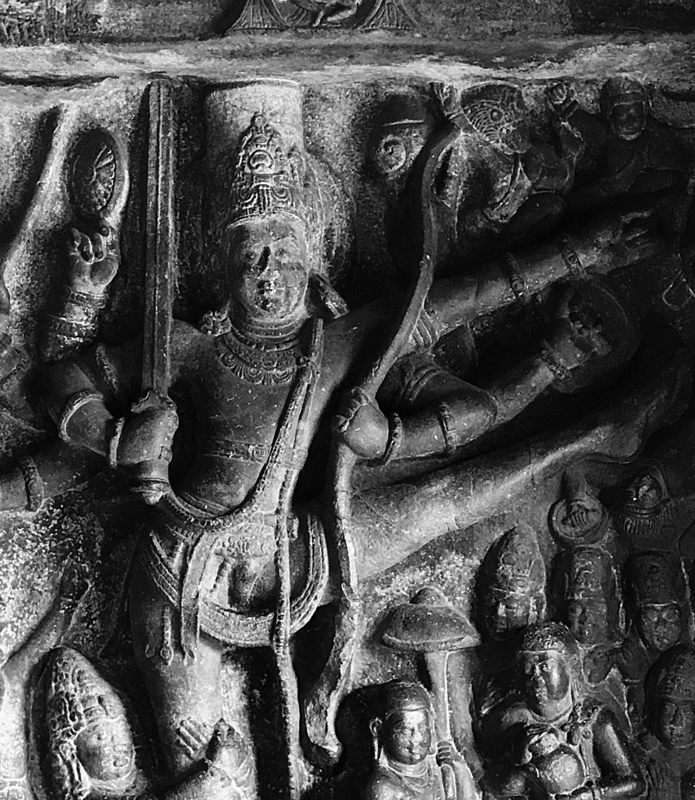 The story of how the monk Tripitaka of the great country of T’ang brought back the Sūtras. In Mair, Victor H. The Columbia anthology of traditional Chinese literature (pp. 1181-1207). New York: Columbia University Press. Zürcher, E., & Teiser, S. F. (2007). The Buddhist conquest of China: The spread and adaptation of Buddhism in early medieval China. Leiden: Brill.